Autumn is harvest time for rice, meaning that all rice that is eaten in Japan in Autumn is as new and fresh as it can possibly be. 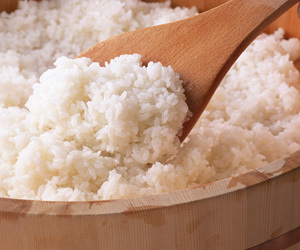 This “new rice”, or shinmai (新米), is said to be sweeter, moister and softer than “older” rice, and Autumn (from September to December) is the only time of year when this rice can be experienced. As you can imagine, this is particularly significant in a country where rice is the single most important food in the local cuisine. A type of mushroom, Matsutake is seen as the Rolls Royce of mushrooms in Japan, similarly to how truffles are seen in European countries. Also similar to truffles is their extraordinary price tag, with one perfect matsutake stem often costing more than 10,000 yen (approx. £60). This is due to the difficulty in finding them, and the fact that they cannot be cultivated. 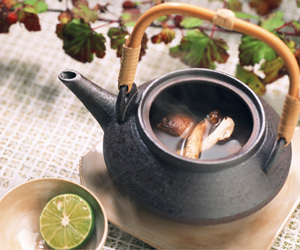 The quintessential matsutake dish is known as dobin mushi (土瓶蒸), a light and delicate clear dashi broth with matsutake and other vegetables, steamed and served in a clay teapot. If you are a fan of mushrooms and are in Japan, the deep aroma and subtle smokiness of an expertly prepared matsutake is an experience not to be missed! As the trees of Japan turn spectacular shades of red, yellow, orange and brown just in time for Autumn Foliage Viewing, some of the trees are also bearing fruit and nuts ripe for the picking. Gingko nuts are particularly (in)famous in Japan, due partly to the spectacular yellow colour the leaves of the trees turn in Autumn, and also in part to the fruit from which the nuts come smelling truly awful – like rancid butter. 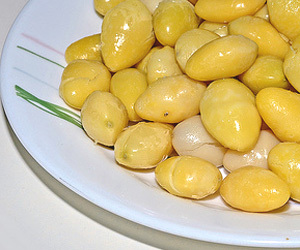 The nuts themselves, however, turn bright yellow and yield a subtly sweet, umami-rich flavour when cooked, perfect for mixing with shinmai rice or added to a dobin mushi. A blog post about Japanese food is not complete without talking about at least one type of fish. Sanma (さんま, or 秋刀魚) is known in the West as ‘pacific saury’ or ‘mackerel pike’, but in Japan this fish is so strongly associated with Autumn that its name literally translates to ‘Autumn knife fish’. 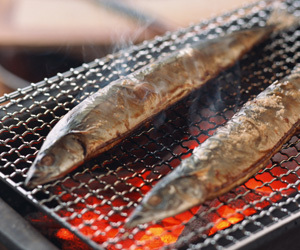 Every Autumn thousands of sanma arrive along the Japanese coasts, brought there by Pacific Ocean currents. Full of good fats and delicately flavoured, sanma is most commonly grilled over an open flame and served whole with salt, or a soy sauce/daikon dipping sauce. Alternatively, if you are in Japan on the first Sunday of September, go to the Sanma Matsuri festival in Meguro and be given one of 5,000 or so grilled sanma prepared in celebration of the yearly hauls from Iwate. To finish this Autumn food tour off, here is something a little more familiar. Kabocha (かぼちゃ) is the Japanese word for pumpkin, and the slightly sweet, hearty Japanese variety of pumpkin is in season in Autumn. While pumpkin is commonly enjoyed in the UK as a soup or as part of a roast dinner, in Japan pumpkin is also seen as a food for frying, either sliced in a shallow fry pan, or mashed up and crumbed as pumpkin croquettes. 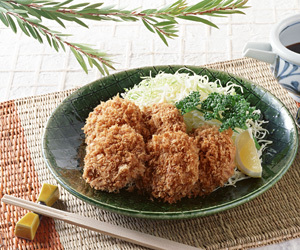 While the concept of a pumpkin croquette may seem a little unconventional, a well-prepared pumpkin croquette is crunchy, just a little bit sweet, and a favourite Autumn comfort food among the Japanese. So now we in the Japan Centre online hub want to know, what is your favourite Japanese Autumn food? Have you tried any of these fabulous foods for yourself? Leave us a comment here, or on our Facebook or Twitter. For more amazing food ideas, take a look at our online shop and recipes! Posted in Food and tagged japanese culture. Bookmark the permalink.